Celebrate a significant day by turning a front-page story into leisurely fun. Click here to see date restrictions. Pages after 1998 are in full color. 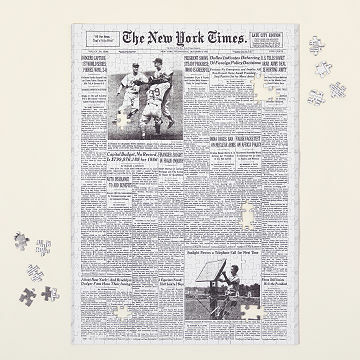 Cool gift for a parent who loves puzzles and newspapers! This is a great gift, but it is a bit challenging with some pieces looking very similar. I have not seen the puzzle but our son loves it. We will spend many hours putting this together. We look forward to the challenge. Love finding unusual gift idea's for those special and hard to find gifts. I bought this as a gift for my aunt, and thought it would be a great unique gift as it was tailored to her birthday. Unfortunately, she has not been able to complete the puzzle other than the boundary- even with a magnifying glass. She was really excited to receive the puzzle, and is accustomed to challenging puzzles, but this one is too much for even her. She was excited to receive the copy of the newspaper from her birthday, though. I am very likely to buy this for another. Even if a person is not a "puzzle person" it is original and interesting. If they love puzzles, it appears to be a good challenge because of the different text and things. I was not involved in putting it together, so I don't know the complete story of whether they enjoyed it. If you are looking for a personalized, one of a kind gift, this would be it! The recipients were delighted with this memento of their wedding date. I customized the date my parents were married, paired it with a bottle of wine. They have a great date night in store for them! They were really excited about the gift and found it thoughtful. Gram is very excited to get started on this so she can frame it when she is done!